Hardcover, 10.75 x 8.5 in. / 128 pgs / 97 color. 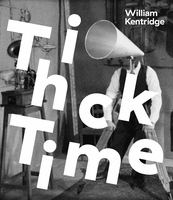 Essays by Maria-Christina Villase“or and William Kentridge. In the course of designing his recent production of Mozart's The Magic Flute, artist and animated filmmaker William Kentridge created a mechanized theater maquette. When he saw the miniature stage's potential as sculpture, projection site, and installation, he began to imagine Black Box, the freestanding structure whose development and installation are documented here. A movement-filled, visually charged piece, it is peopled with two-dimensional mechanical figures, completed with scenic elements and lit by flickering video. A digital projector displays animated films created from Kentridge's charcoal drawings and sculptures. Kentridge considers his title term in three senses: a "black box" theater, a "chambre noire" as it relates to photography, and a "black box" flight data recorder, as used in airline disasters. The clandestine fourth reference may be to his ongoing exploration of German history and its convergence with South African history through Namibia, a former German colony that came under South African control prior to gaining its independence. Black Box evokes all that, and the joyful mechanics of pre-cinematic visual spectacles, magic lanterns, the camera obscura and the zoetrope. A unique and richly layered meditation on the act of seeing, on vision and experience, and on the nature of knowledge itself. Edited with text by Vinzenz Brinkmann, Kristin Schrader. Text by Michaela Ott, Oliver Primavesi. Edited with an introduction by Carlos Basualdo. Foreword by Federica Galloni. Text by Gabriele Guercio, Salvatore Settis. Edited with text by Iwona Blazwick. Text by Homi Bhabha, Sabine Breitwieser, Michael Juul Holm, Joseph Koerner, Denise Wendel. FORMAT: Hardcover, 10.75 x 8.5 in. / 128 pgs / 97 color.